In order to get the most accurate fish count, divers try to be as inconspicuous as possible. One concern that scientists have, however, is that the bubbles created by breathing out of an open-circuit scuba tank may scare timid fish away, thereby causing a survey to not be as accurate as it possibly could. In order to address this issue, scientists on this cruise are testing out the possibility of using closed-circuit rebreathers (CCRs) to conduct fish surveys instead of traditional scuba gear. Because rebreathers do not produce any bubbles, it is believed that scientists have a better opportunity to observe marine life in its natural habitat as it is not scared away by the bubbles and noise produced by open-circuit devices. This is how a closed-circuit rebreather works: After circulating to your lungs, the air in a CCR is circulated back into the rebreather to be used again. It functions by passing exhaled air through a “scrubber” that removes the carbon dioxide and then adds small amounts of oxygen to the recirculated air to maintain the proper pressure of oxygen. The device gets its name from the fact that you are basically rebreathing the same air over and over. Because divers are not exhaling air into the water, no bubbles are created. 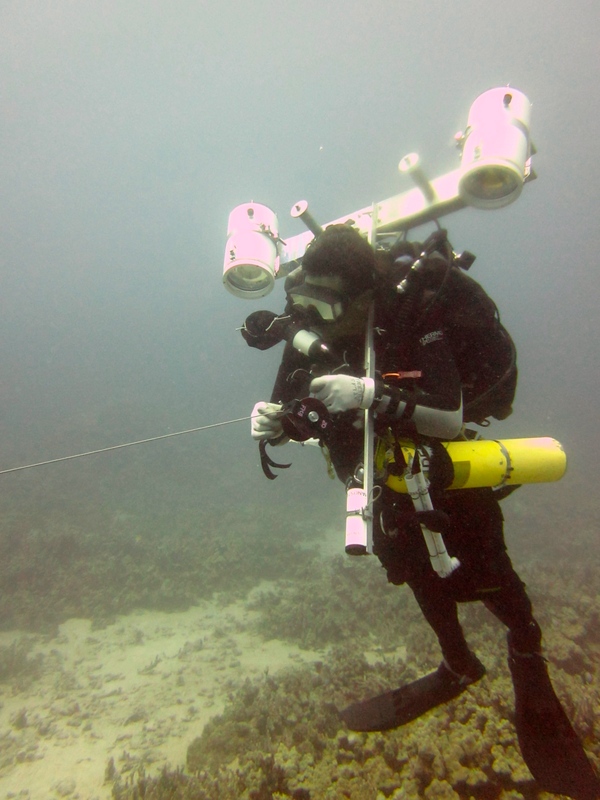 On this cruise, divers are testing out rebreathers to use for fish surveys by doing two separate dives at the same sites: one using an open-circuit scuba, and the other using a CCR. They perform fish surveys in the same location using both devices, and then the data they gather is put into a computer system. After scientists have done this many times (at least 30), they can start to compare the data to see if more fish are visible while using a closed-circuit system rather than an open-circuit one. I know many of you are very interested in computers. You enjoy using them, and some of you even dream of having a career working with computers in the future. Well, did you know that you could be a computer specialist AND work on a ship? Yes, you can. You can travel the world and also be a techie. May I introduce Kevin Trick, the Data Management Specialist for the Main Hawaiian Islands Reef Fish Survey 2015. 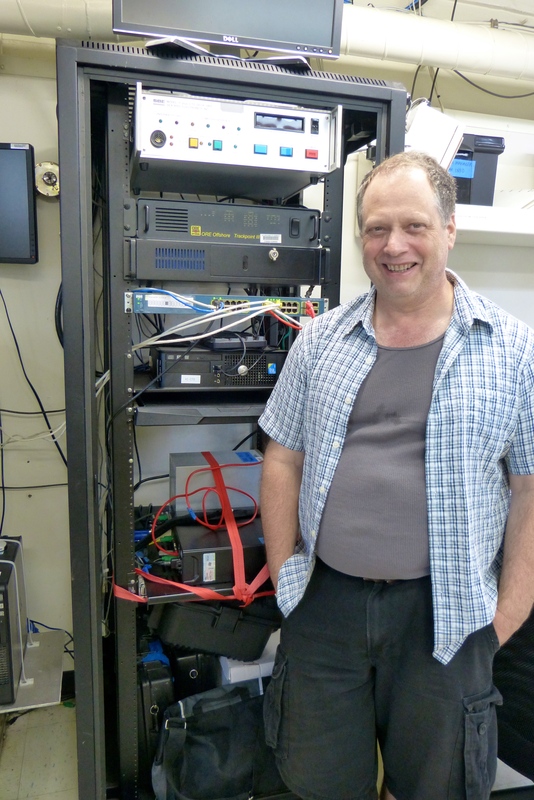 Making sure the data collected by the scientists is properly handled and stored on computer systems so that it can be used for scientific purposes. I work in the NOAA offices at Pearl Harbor, and spend about 50 days a year at sea. I also fly to American Samoa to do consulting with the scientists at the Department of Management Wildlife Resources. Doing something that helps humans survive for the foreseeable future. I help scientists study how humans are impacting the natural environment to inform policy and decision-making. The data is the only thing that will live on after we are gone. A BA in computer science and/or data management. I have 20 years of experience working with computers. I learned by taking care of the computers in all my previous jobs and moving my way up. I worked for the Department of Fish and Wildlife before NOAA. 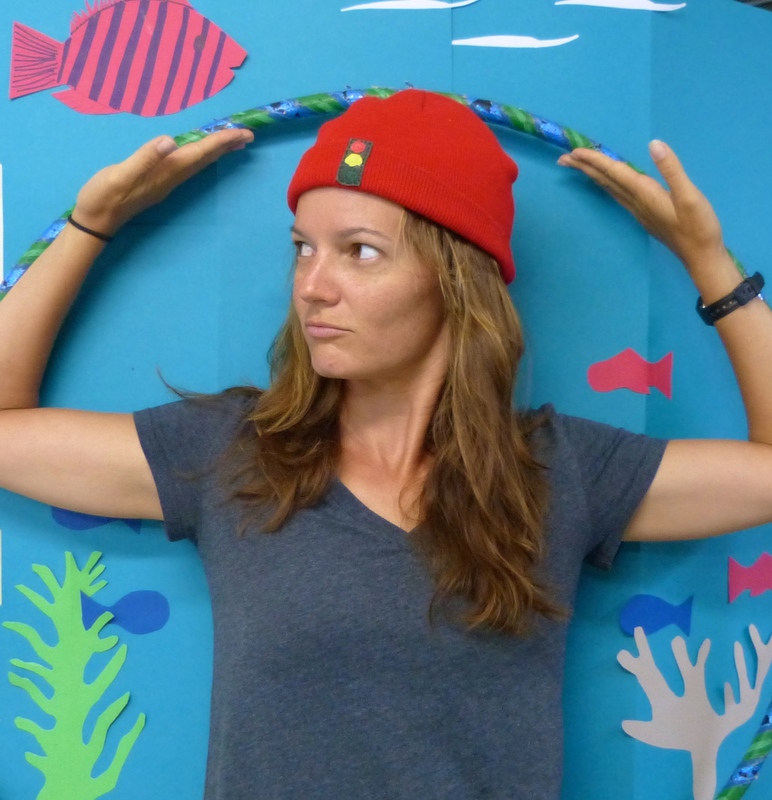 I am currently working on a degree in Marine Science—it is never too late to learn! Find out what you really want to do: programming, managing data, systems analysis, etc. and focus your studies on that. Find a skill you love to do and keep following that—never give up. I’m sorry to tell you all, but I’ve been murdered. I was killed on the bow of the ship with a data sheet, tricked there by a person whose name I will not mention with the promise of seeing dolphins; a shameful way, in my opinion, to use such majestic creatures. I was the seventh person aboard the Hi’ialakai to lose their life. There are only 3 scientists left. Who will be the last one standing? (I hope it’s not Kevin!) We have been playing a game called “The Culling,” which is basically a shipboard version of the game Clue. Everyone draws a name, a location on the ship, and a murder weapon. In order to “kill” the person whose name you drew, you have to be in that location with them holding the murder weapon. My money is on Louise for the winner. She is a master with the hula-hoop. I have really enjoyed being out on the small boats with the scientists as they complete their dives. It is exciting to see how the work is done, how the small boats maintain constant communication with the Hi’ialakai, and how the coxswains maneuver the boats and take care of the divers. It is also nice just to be out on the water, to feel the rock of the boat, to see the island coastline, and to do a bit of snorkeling so I can also see some cool fish. 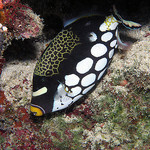 There are many different species of triggerfish, some of which are native to the Hawaiian Islands. They have very sharp teeth to help them eat their diet of shelled animals. In order to hide from predators, triggerfish “trigger” their fins to extend so that they can lock themselves into small openings to keep safe. This entry was posted in 2015, NOAA Fisheries Service, NOAA Teacher at Sea, Sandra Camp and tagged accurate fish count, bubbles, closed-circuit rebreathers (CCRs), Computer Specialist, open-circuit scuba tank, recirculated air. Bookmark the permalink. I am snorkeling, and I did see lots of fish. We haven’t discovered any new species of fish, but the scientists counted many different varieties. Ha Ha! You scared me for a minute! But then I realized you were “killed” with a data sheet. Something smelled fishy and it was not the fish you saw. Have you ever played the game Clue, Joanna? It is fun! No I haven’t but I will check it out. How was Mexico? I am in San Sebastián, Spain right now. It was awesome! I went zip-lining in Canopy El Eden which is where they shot the movie The Predator. All of the lines were “Predator” themed. The best part was that we went with a lot of friends. 62 people to be exact. Have fun in Spain!!!!! 62 people? Holy cow! I don’t think I know that many people. Glad you had fun. 😄Next year we are hoping for a 100. Five families didn’t come this year.